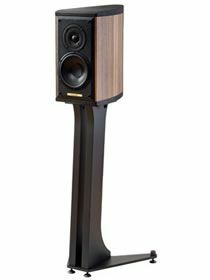 Monitor Wood's sumptuous and pleasing lute shape is enhanced by the complementary blend of leather and natural walnut, while extoling the sonic virtues of the classic Sonus Faber mini monitor. 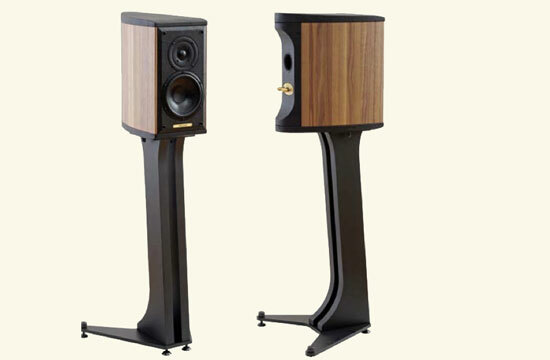 Exceptionally open and resolving, the Liuto Monitor is a formidable loudspeaker that belies its size. An artisan's attention to detail abounds, resulting in a precious instrument in the service of music. SYSTEM: 2 way floorstanding vented box loudspeaker. CABINET: Lute shape design ensures excellent stiffness avoiding resonances and standing waves. TWEETER: 25mm high definition precoated fabric dome driver with wide soft polymer surround and rear chamber. Custom design. MIDRANGE: 150 mm cone driver. A free compression basket design and a thermo-mouldered polypropylene textile cone, also known as "curv", ensures an excellent dynamic performance. Custom design. WOOFER: 220 mm lightweight Aluminium/ Magnesium alloy cone driver. Ultra dynamic performance an linearity. Special coaxial anti-compressor is used, designed to remove cavity resonances and distortions. CROSS-OVER: Non-resonant second order design, optimized phase characteristics for optimal space/time performance, cross-over point 3.500 Hz. FREQUENCY RESPONSE: 55 Hz - 25000 Hz, tuning port included. SENSITIVITY: 86 db SPL (2.83 V/1m). POWER HANDLING: 30 W - 150 W without clipping. FINISH: Combination of black leather and natural walnut. 19.5 kg per pair-shipping weight. Weight: 15 kg per pair - net weight. TOTAL DIMENSION: 1023 x 395 x 336 mm (HxWxD).